Located in Akkarai on ECR, the unassuming two-month-old Andhra Tiffin Room is among the first in the city to offer traditional vegetarian Andhra tiffin. It opened under the aegis of Nivy Enterprises who also run Delhi Dhaba right opposite and Southern Terrace further down ECR. In the airy restaurant, with walls covered with graffiti, we tuck into platters of spicy podi idli (tiny idlis smeared with gun powder and ghee) and tangy majjiga polusu idli (idlis in buttermilk), accompanied byhot mugs of filter coffee. No sooner do we polish them off, than manager Kumaresh Narasimhan orders the dosas, of which they have more than 12 varieties. The stand outs are Nellore Karam dosa stuffed with ground red chillies and sesame seeds, the Avakkai dosa, made with spicy mango pickle, and the fiercest of the lot, the Nallakaram dosa, made with red chillies from Nellorea��all served with groundnut, coconut, tomato and ginger chutneys and a bowl of steaming popullusu (the Andhra version of sambar). The eatery also boasts authentic ginger and karivepaku dosa and their trademark pesarattu (made with green gram). a�?Our dosas are popular with the Andhraites here and the college students, who flock here by early evening,a�? says Narasimhan. 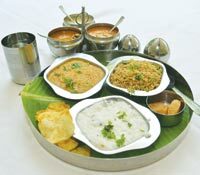 Meanwhile, chef Narasimha Reddy asks us to try their Andhra special tiffin meal consisting of steaming bowls of flavoured rices namely nimmarasanam (lime rice), poppulasanam (the Andhra take on sambar rice) and perugannam (curd rice). 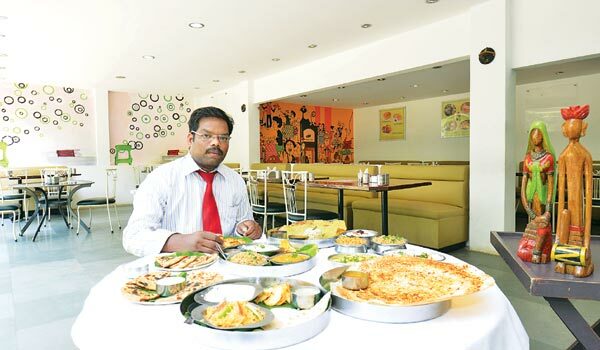 Nellore-based Reddy says he plans to add nimma pappu rotis served with authentic Hyderabadi gravy (with paneer and green peas) to the menu. He also hopes to serve traditional Andhra desserts such as the lentil and coconut poli soon.